This Mexico section was lost when there was a computer/internet glitch earlier. I’m getting smarter, all the older web pages have been backed up to the server, so if the worst happens, I can resurrect them. I’m also doing the preparation on Word and saving, this is a second back up. 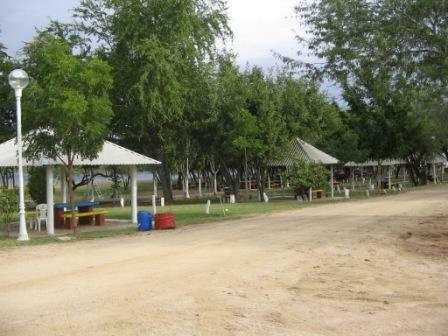 La Penita RV Park, La Penita De Jaltemba Mexico. 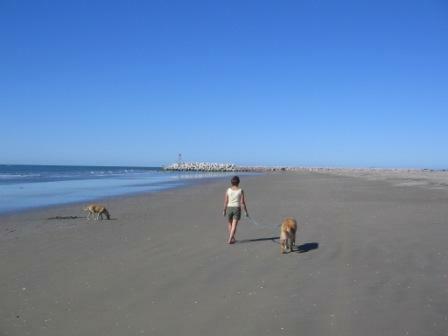 After staying 4 days in Playa Amor, we moved down here, less than 100 km. down the coast. 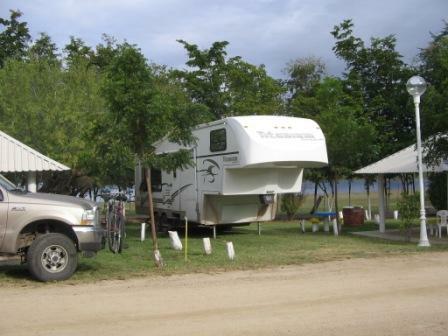 The RV Park is owned or run by a Canadian named Carol. We were under whelmed, to put it mildly, the sites are very close together, you have to reserve a parking slot for your tow vehicle and there are too many sites cramped together (over 100).We hope that there are better representations of what Canadians can do down here. As well, the crowd is kind of cliquish, they are trying too hard to have fun and we felt unwelcome. 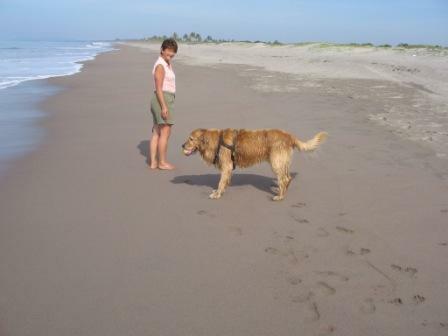 We checked out another couple of towns between here and Puerto Vallarta, without seeing any vacancies. 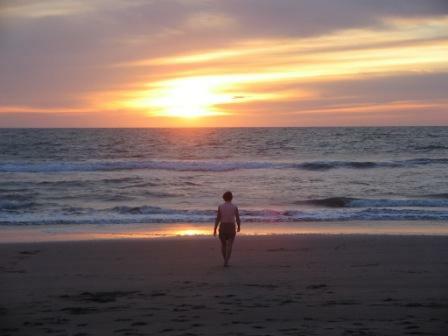 As a result, we made the decision to retreat back to Playa Amor, where there are vacancies and the crowd was a great one. 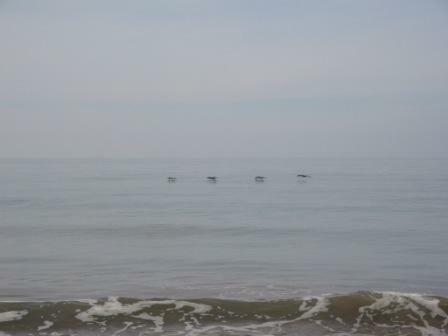 The view from our site, the only redeeming factor was that they had free phone calls to the US & Canada, there was always a line up! 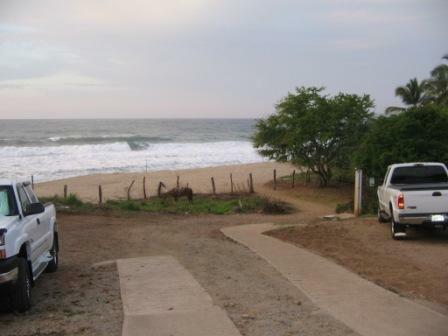 After moving down from Teacapan, we stayed at this beautiful RV park for 4 days initially, and returned to spend 3 weeks more (see above and on the second Mexico page) Great campers, good local food and the sound of the surf nearby made this stop a great one! 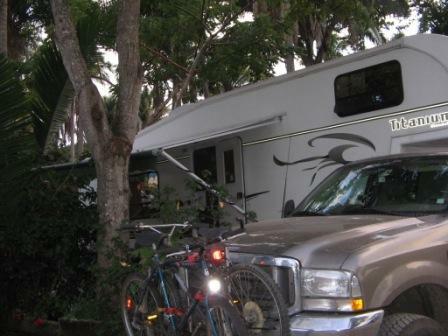 We spent a total of 4 days at this RV park, the first 2 were right on the beach, then we had to move into the overflow, as the beach sites were all booked. 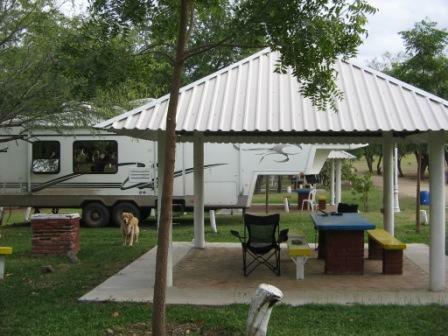 The owner is building a great RV park, and is being helped with business by the closure of Rancho Los Angeles just up the road. The entry to the campground is down a dirt farmer's road, sometimes you have to yield to the animals, in this case a horse! 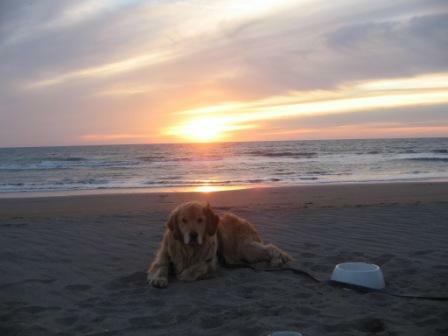 Kasey waiting for the sunset! 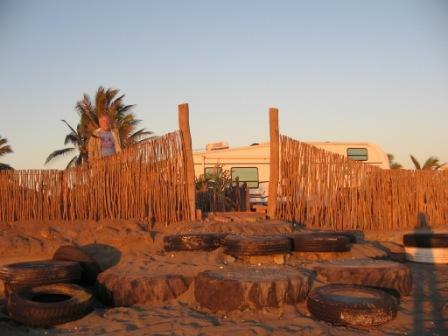 We stayed for four days in Mazatlan in a campground called Playa Escondida in the north part of Mazatlan. The park is not well looked after in that you have to check to see if the services at each camp site work (it's hit and miss, only half seem to be operational). We were fortunate in that the rear, 100 or so sites are reserved and maintained by about 4 caravan companies, and the caravans were not arriving until after mid-January, so we got a good site in the back. 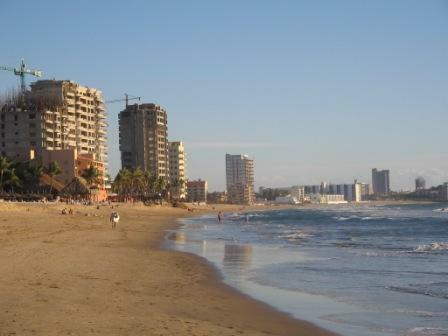 Mazatlan is kind of busy and too congested for our liking, but we provisioned in town and toured around. 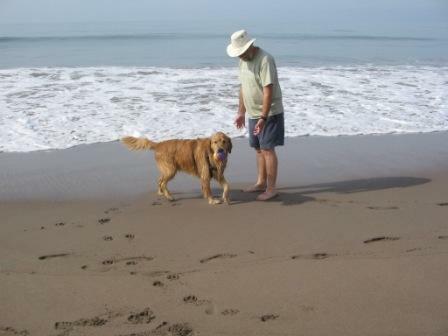 We met another RV'er who we had met initially in San Carlos. 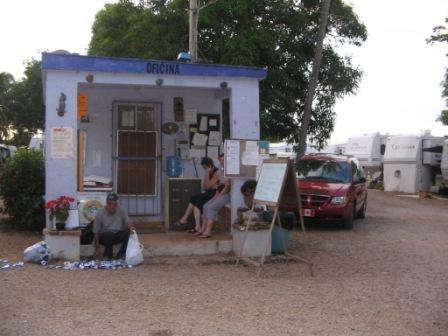 On our way in to Mazatlan, we accidentally went the wrong way on a traffic circle north of town; the locals were very accommodating, they stopped us and let us back around so we got on the right side of a divided roadway. The road signs for the traffic circle were almost non-existent, it was easy to go the wrong way. 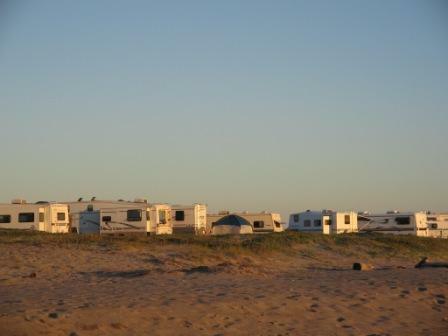 This is view down the beach, a lot of the properties are being bought up for condos and hotels, and RV campgrounds are also disappearing. 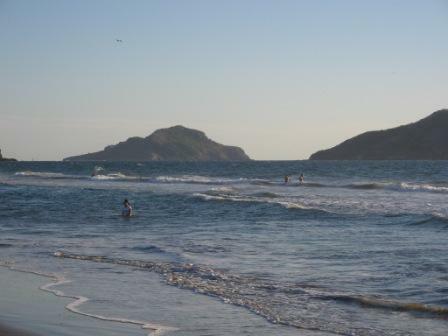 We get the impression that Playa Escondida will be one of these. 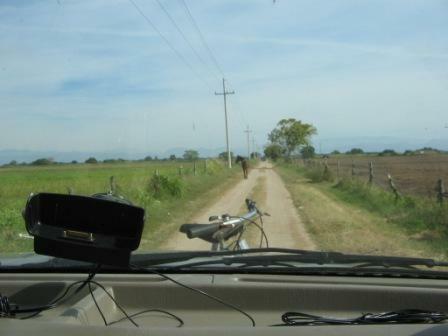 Between Las Glorias and Mazatlan, we drove through Culiacan, hoping to find the campground in town, without success. The drive was no fun, the only factor in our favour is that the RV and truck had some intimidation value. 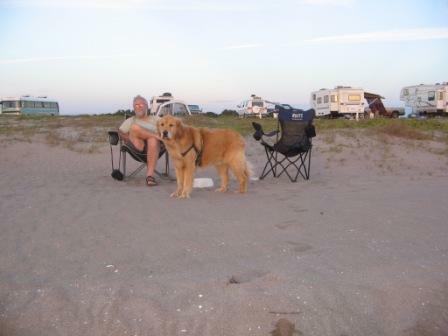 We found a second campground, which was actually a recreation area, that had electric and water, but no sewer or dump, it turned out to be a better choice, it is close to the highway and was easy to get into. Down here, you have to watch for polarity problems with the plugs (hot and neutral wired backwards). The first plug had this problem, the second plug we tried was OK. It was a good one night stop on the way to Teacapan. 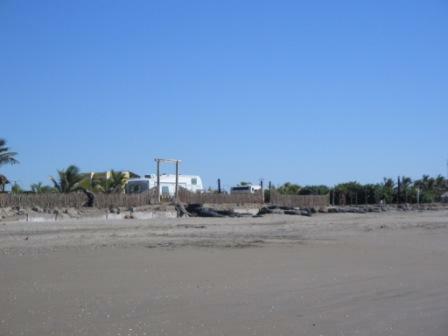 We dropped into this resort on the Gulf of California and spent New Years Eve here. 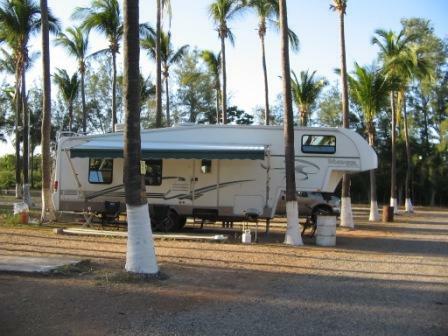 The RV resort is a parking lot around the hotel, it has full services (15 amp), and the hotel pool can be used. There is a "camp" dog here that had puppies recently, the campers are supplying dog food of various types (the puppies were actually eating cat food when we were there). 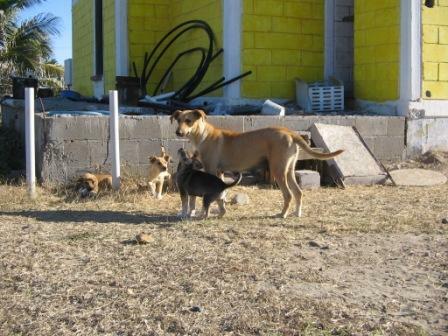 The puppies live in a den under a concrete slab near the washroom. Suzette fell in love with them! New Years Eve was interesting; we had a delicious whole fish for dinner, and we were plied with tequila from a local, one glass of this potion and we were almost horizontal! Needless to say, we missed midnight! Another camper was not quite so lucky, we asked what time he got home, and he said he didn't remember making it back into the camper!